It's the country's best World Cup performance ever. 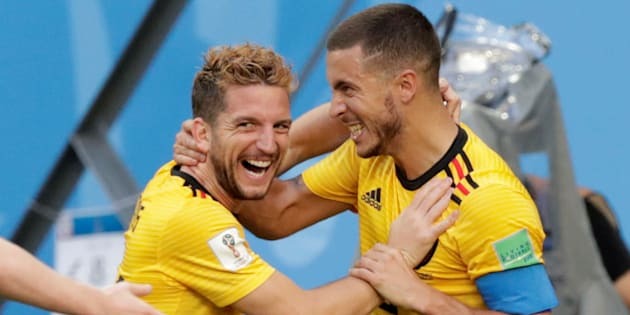 Belgium's Eden Hazard celebrates scoring their second goal against England with Dries Mertens on Saturday. ST. PETERSBURG, Russia — Belgium earned its highest World Cup finish on Saturday by beating England 2-0 in the third-place match. Belgium's Eden Hazard scores the team's second goal against England on Saturday in St. Petersburg. England, which lost to Croatia in the semifinals on Wednesday, matched its best World Cup result — fourth in 1990 — since winning the tournament for the only time in 1966. England forward Harry Kane is still placed to win the Golden Boot with a tournament-leading six goals ahead of Sunday's final.